(extension) and the hamstrings (flexion). Meniscus tear is a common injury that affects the knee joint. The meniscus are ‘C’ shaped discs, made of tough cartilage called fibrocartilage. They are positioned on the tibial plateau (top surface of the shin bone) between the tibia (shin bone) and the femur (thigh bone) and are important for distributing load and absorbing shock at the knee joint. There are two menisci within each knee joint. Meniscal tears can occur in isolation or in combination with a ligamentous injury. The meniscus in the knee is usually damaged by a twist occurring on a slightly flexed knee. A partial or total tear of a meniscus may occur when a person quickly twists or rotates the upper leg while the foot stays planted. Repeated or prolonged squatting can also tear the meniscus. Meniscal tears can be degenerative or traumatic. Degenerative tears occur as part of progressive wear in the whole joint or as a result of habitual, prolonged squatting. In the older adult, the tear may be due to a natural degeneration of the menisci that occurs with age. The traumatic type of injury is quite common in the athletic setting. The medial meniscus is more commonly affected than the lateral meniscus, whilst tears in both menisci are much less common. Pain is usually experienced when a meniscus is injured, particularly when trying to straighten, bend or twist the knee. 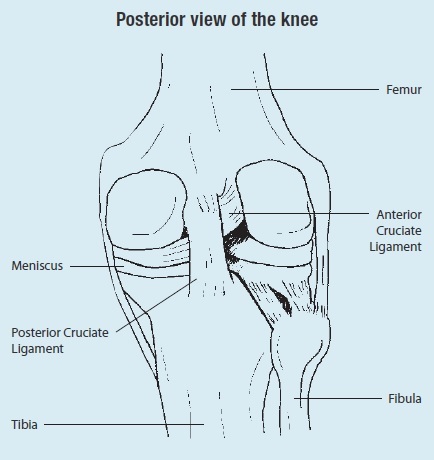 If the tear is tiny, the meniscus stays connected to the front and back of the knee. If the tear is large however, the meniscus may be left only slightly intact. Severe, intermittent sharp pain may occur, and is localised to that side of the joint. This results from part of the tear catching between the articular surfaces of the tibia and femur, blocking full extension of the knee, causing a ‘locking’ sensation. Swelling may occur soon after the injury or several hours later as a result of inflammation. Complaints of clicking, popping or locking of the knee may also follow a meniscus injury. In some cases, after the initial swelling and pain, the joint settles down and normal activities can be resumed. This may be because the tear in the meniscus is small or the flap does not affect joint mechanics. A sports medicine professional should be seen as soon as possible to determine the extent of the injury and to provide advice on treatment required. A sports medicine professional may perform a physical examination and take x-rays of the knee. An MRI test may be recommended to confirm the diagnosis. An arthroscopy may also be used to help diagnose and treat a meniscal tear. If the tear is minor and the pain and other symptoms cease, a muscle-strengthening program may be recommended. A large tear produces a flap of meniscus that may interfere with normal joint mechanics. The torn flap of meniscus can cause further damage leading to greater risk of degenerative arthritis. Due to the nature of the tear that the menisci can suffer, repair of the meniscus can be a complicated issue. A meniscal tear that is symptomatic (painful with activities of daily living) may need to be addressed surgically. If so, this is now done by arthroscopic (keyhole) surgery which allows the surgeon to remove the flap and smooth off the surface of the meniscus, or if possible repair the torn meniscus. This will leave ‘normal’ structures and decrease the likelihood of degenerative arthritic changes. The major goal of the rehabilitation program is to normalise walking, normalise pain-free range of motion, prevent muscle wastage and maintain cardiovascular fitness. Rehabilitation after meniscus surgery should focus on early mobilisation of the knee joint and quadriceps and hamstring strength. Weight bearing exercises should be added as directed by a sports medicine professional. Regardless of the form of surgery, rehabilitation usually includes walking, bending the legs, and doing exercises that stretch and build the leg muscles. Return to play after a meniscal injury is expected. The timing is variable and depends on the injury, treatment and rehabilitation protocol. In many cases, return to sport can be as soon as two to three weeks or as long as six to eight weeks. Strapping, or taping, can provide an added level of support and stability to weak or injured knees during the rehabilitation process.